A few years ago I created a couple commissioned pieces for a Lady Gaga impersonator, and whilst I am sure I shall write about the more unusual pieces (the be-tentacled, PVC octopus number was thrilling and punishing in equal measure! ), this Tailored Gold Applique Jacket was my favourite. Tailoring a Jacket is always a complete joy... no, I'm not mad!... and this was created from a heavenly Duchess Satin- not silk but hey, you can't have everything on a limited budget! I love Duchess Satin because it just behaves itself in a way other fabrics simply refuse to, and it feels heavenly, faux or no. The pattern was drafted according to my clients measurements, then I overlayed pattern paper on top of the pattern and drafted the applique pieces. I looked closely at the Lady Gaga original however; I simplified and adapted the design slightly so it wasn't an exact replica (don't wanna offend those lawyers, yo!). The appliques' I cut from a Gold Lame, which wasn't too brassy, then backed with a fusible interfacing so it wouldn't fray too much. Gold Lame can be hideous like that. After carefully pinning each applique carefully on to the cut out pieces of Duchess Satin, I closely zig-zagged around the edge of each one so it would stay in place. I then set my Pfaff to a mid-size, very close Satin Stitch and went and the edges again. Finally, on the Gold Lame but exactly next to the Satin Stitch edge I stitched a small-ish straight stitch. This helped 'bed' everything in and created a line between the Lame and stitching, which in turn created a nice stitched border. Once the applique was finished- which from memory took approx. 12 hours in total- it was time to make up the jacket, which was tailored by machine, not by hand as is tradition. Zig-zagging the Pad Stitching by machine is an incredible effective and quick way to create the Pad Stitching needed to assist the curve and shaping of the Collar. This is a technique I learnt whilst training in the U.S., and proves very useful for Commissions like this where there isn't the time to tailor by hand. 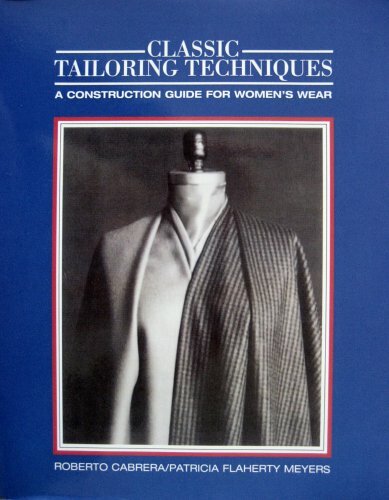 We used a book called Classic Tailoring Techniques - which I still have, and use- in the Costume Shop and I would strongly recommend. It's a manual of Tailoring and takes you through every aspect of tailoring a jacket. A must have if you want to learn. Using Horsehair Interfacing, and edging the Seam Allowance and Roll Line with Cotton Tape to ensure a sharp Collar edge when turned out, the underside of the lapel and collar were zig-zagged and steamed to 'roll' along the line of the Cotton Tape. This method is quick and accurate, but reduces the time needed to create a Tailored Jacket by a good day or so. Once Tailored, I sewed up and attached the lining, finishing the Jacket. I really did love making this commission, the finished look evoked the Lady Gaga original very closely. As ever, I had a strict budget to stick to whilst creating this. I quoted £650, and I managed to create it for this price, just about. With anything as unique as this the money is spent on time- perfectly cutting out the appliques, painstakingly Satin Stitching them on, embellishing with Crystals... the list is endless however; this price would not have been attainable with out Quick Tailoring the Jacket. I think she turned out beautifully, and she cut quite the dash on stage! A Swan Lake Tutu on a budget. A super quick sketch, outlining my ideas. Because of the tiny budget I had to drop the Tutu decoration. Swan Lake has always held a special place in my heart, I have seen it performed countless times- the best? At The Royal Albert Hall with 60 Swans! !- and every time I fall in love all over again with the music, performance and costumes. I had a small budget to create this Costume, which was part of a production run of Costumes for a Holiday Park a couple years ago. Even though there was just Odette to be created, and even though I had to restrain myself ; I knew I simply had to have a traditional Tutu with some feather detailing and the above illustration was my starting point. I decided to work the budget to my advantage by making a simple 12 layer Classic Tutu, but not decorate it, then create a simple Classic Tutu Bodice with a suggestion of the decoration one would normally see in a production of Swan Lake. I had some feathers, calico backing and sparkle mesh left over from another project- which saved me a few more pennies- and I decorated a simple tiara from Primark with a couple feathers to complete the look. There are normally 14 layers in a Traditional Tutu, ranging from 3cm to 32cm. I had saved myself a little money by nix-ing two layers which would save time and fabric… over all I used over 20m of Net and all layers- once cut and pieced- needed to be snipped and cut to create the classic Swan Lake zig-zag edging. As I cut the layers I made sure to pin very closely so there was no movement. I then pinned a template on top of each layer with another set of pins and cut the zig-zags. It's a little more time consuming to do it in this way but if the net moves at all the zig zags fall out of line and become messy (believe me, I only know this stuff because I have done it the wrong/fast way first!!) which is a true shame. When making something with such a simple effect it is important each element is perfect. Once snipped, each layer is gathered and sewn on to the Basque. This process takes one worker over 10 hour to accomplish and can get fairly intense!! The Basque can start to curl about half way through and it is about at this point that you think you wont win, but win you do and a few hours later you have the most wonderful sight… a fluffy, untamed Tutu! Tacking stitches are inserted in a very specific order- a large zig zag- to tame the beast, the Bodice is made up and decorated and all of a sudden, a weeks worth of work looks so beautiful you can almost… almost… forget the pain of all that gathering! And finally, a shot of the inside, because sometimes they're just as wondrous as the outside! Voila! There you have it. I made this Tutu and Bodice in 4 days- mainly because of budget constraints I had no more time to give to it- and was pretty happy with the result. I seem to recall the fabrics cost approx. £42.